OnePlus 5T Does Well In JerryRigEverything's Tests - AndroGuider | One Stop For The Techy You! Whenever a new flagship phone is out, one thing is for sure - JerryRigEverything will put it through his torture tests and find out how durable it is. 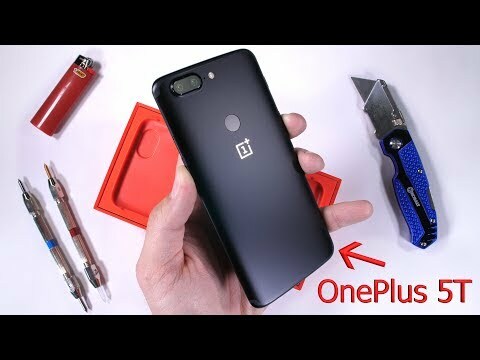 The latest entrant to JerryRigEverything's torture chamber was the OnePlus 5T and it fared just as well as it's not-so-elder sibling the OnePlus 5. The first of the three tests was the scratch test. The 5T packs in a 6.01" OLED screen backed by Gorilla Glass 5. Like its other flagship counterparts, the 5T's screen starts giving away to Zack's (aka JerryRigEverything) Mohs picks at a level six. It is worth mentioning here that the 5T's 18:9 display is covered by a screen protector out of the box. The scratch test was performed sans the screen protector though. In the flame test, the OnePlus 5T lasted twenty seconds. This is definitely more than the average time a phone has lasted under Zack's lighter this year. The ultimate test of durability is the bend test and the 5T does fine here. There was a little flex when JerryRigEvrything bent the phone on its back but the OnePlus 5T still managed to hold itself in one piece. On a whole, the 5T fared well. You can check out the video atop if you wish to witness the torture in action.